Virginia Jack is going head to head and heart to heart against the Who-tang Clan! Come support us to make us happy, and vote for us to make us double happy! Doors at 7! Show at 8! Dollars are 5! Cafe Deux Soleil will host the smackdown. 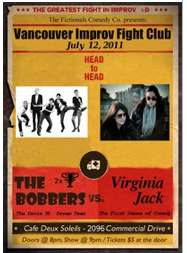 Vancouver Improv Fight Club returns to Cafe Deux Soleils on July 12th with enough storylines to make the WWE jealous. The Bobbers – reigning VIFC champions – are going for their third win in a row. If they win July’s match, The Bobbers will be retired into the VIFC Hall of Fame, get an automatic bye into the year-end Tournament of Champions, and recieve a special prize from the hosts, The Fictionals! However, The Bobbers will have… to defeat one of their own to get the glory. 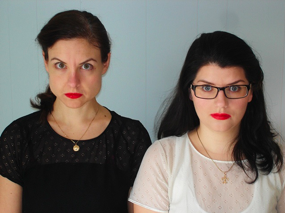 The challengers this month are Virginia Jack, a talented improv duo made up of Nicole Passmore and Briana Rayner. When not entertaning crowds with V.J., Ms. Rayner is also a member of the Bobbers (Whaaat?). Who will walk away as champs? At the end of the showdown- featuring top-class long-form improv and classic “Whose Line” games – it will be audience votes that decide who is victorious, so it’s up to YOU! #1 rule of Vancouver Improv Fight Club: Talk about Vancouver Improv Fight Club. Crush Improv is delighted to offer you a selection of improv comedy by our esteemed and talented friends from across the nation. A dégustation, if you will, of coast-to-coast comedic stylings. $10 – buy them online in advance. Show has sold out for the past two years! Hosted by Cari Leslie. Smooth charm and style by AL Connors. *Keep your pants on. Come on guys, really. Impulse, co-presented by the Instant Shop, is a celebration of University-aged improv and features four nights of performances and a variety of workshops. In addition to new combinations of UBCimprov players, visiting improv groups are coming from Ontario, Alberta and Washington State. This year, we are also highlighted established Vancouver groups with alumni connections. We are happy to have Virginia Jack (one UBCi alumnus* and one former solo tournament winner**) on board. The show on March 25th starts at 7:00pm and takes place in Scarfe 100 at UBC. We are excited to be performing in this show this month. After its sold-out debut in January 10 SPEED is back on March 15 for another salacious night of ten-minute sets from the best in Vancouver improv. This show will be full of great improv. If groups end their sets between nine and a half and ten minutes, we’ll donate to a charity on their behalf. For each minute they go over ten we will disrupt their scenes, characters, and personal lives in increasingly upsetting ways. Virginia Jack will be playing in the Instant Theatre Cage Match Thursday, February 24.